Every year during Deepavali or Diwali, after the ritual oil bath and arati (a ceremony with lamps) my sister and I wore our new clothes and off we went to deliver parcels of sweet boxes to our near and dear ones. Then we came home to an elaborate festival lunch. There would be no time to nap as we were to get ready again for the Laksmi Pooja at my father’s factory. Soon after the pooja, my parents distributed gifts and sweets to all the people who worked there (a tradition which continues till today). This was a wonderful time to meet all the staff and factory workers as well as all our family friends who came visiting. Once the festivities at the factory were over, we began our journey to Siddapur to complete the remainder of the festival in our ancestral house. More traditions and traditional food followed. After the main pooja at the family home, our grandparents sat on the sofa and each of us went one by one, to collect prasad offered to the deities. Then all of us sat together and enjoyed the deepavali meals. Times have now changed. I really miss my parents and siblings and other family members during this festival, being grateful for such strong and everlasting memories. But I now have my own family and this is Harivansh’s first diwali with us as last year I was at my parents following his birth. It is now my onus to carry on the traditions and hopefully create beautiful memories for my precious son. 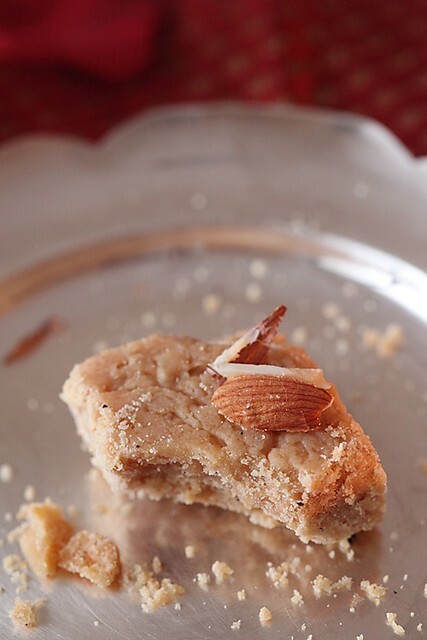 My grand mother often made these delightful burfies in her hey days and when I called her for the recipe, as I usual I commented “Ajji, isnt this too much sugar?” she insisted that if I cut the sugar then I wont get the right consistency and texture. I went ahead and made these, verbatim and after all this is a time we shouldnt be worrying about sugar and just be a part of the celebrations with our family and friends. They were so delicious that I couldnt resist eating them as I was shooting them. They are great to make and share with family and friends during this festive season. These are called seven cup burfies as there are seven cups of ingredients going into them, the other ingredients being optional and for garnishing. 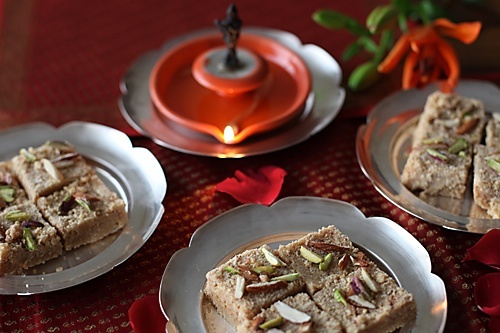 If you havent made burfi before, then this is quite easy to begin with. You just need to have all the ingredients ready, put them in the pot and cook them until the fudge consistency is reached. Wishing all of you a very happy Diwali and I really wish I could share these with each and every one of you. You can use any size cups, but make sure to use the same cup to measure out all the ingredients. The almonds, pistachios and saffron are optional for garnishing. Use them to give your sweets an elegant and decorative feel. Line a 9X9 square baking tin with aluminium foil and lightly grease it with some ghee. If using the saffron then warm it over a heavy bottomed cast iron skillet and lightly crush with a mortar and pestle. In a heavy bottomed large wok or kadhai, put in the ghee. After it melts, add in the chickpea flour, coconut, milk and sugar and cook on a medium flame until the mixture comes to a boil, stirring all the time to prevent the ingredients from sticking to the bottom of the pan, about 10 minutes. Once the mixture comes to a boil, lower the flame and continue to cook until the mixture thickens, comes together and starts to leave the sides of the pan, about 35 to 40 minutes*. Once this happens, stir in the ground cardamom seeds, give it a good mix and pour the fudge into the prepared pan. Level the surface with a spatula. Sprinkle with the optional almonds, pistachios and saffron. Cut into pieces while still hot, you can lift them up when cool.Once the fudge sets you cant cut it. * I use a standard 250 ml cup. If you decide to use a smaller cup then the cooking time is also reduced accordingly. Wishing u n ur newly extended family a very happy Diwali. As usual pics r too gud n the desc. as well, i could feel the taste of burfi in my mouth while reading the method n lookin at the pics. I wish i had a collection of such delicious recipes as u have so that i dont have to check every morning n get disappointed if nothing new shows up,though i forget all that if i see a new recipe. Tons of thanks in advance for all the upcoming new recipes from u. Happy Diwali Anushruti. Wishing you and your family happiness and prosperity.. I have never made this kind of burfi. Will add the coconut with besan next time I make it. Lovely pictures. Sridevi: Thank you. 🙂 You really made me smile. You can always mail me for a particular recipe if you want to and the collection of recipes here is all yours. Wish you and your family a happy diwali too. 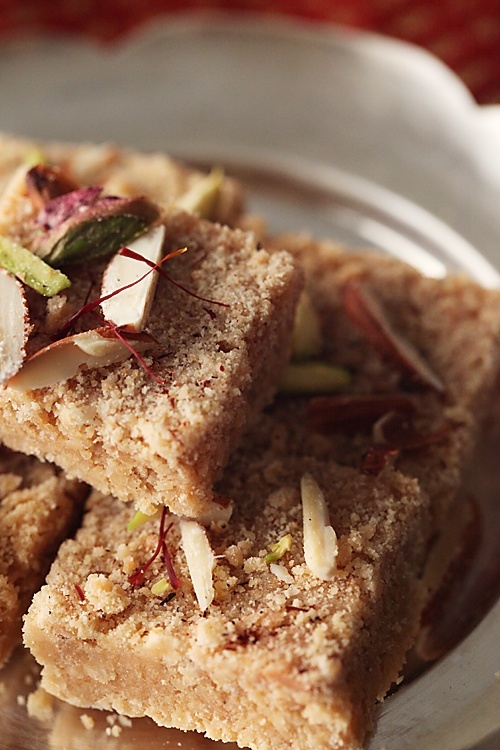 Soma: You will love this burfi, I'm sure. Wish you and your family a happy Diwali too. Sharmilee: I love the bite of coconut in this burfi. Talking about it is making me crave for more and I'm going right now for one. And yes…wish you and yours a happy diwali too. hope u had a fun diwali ! 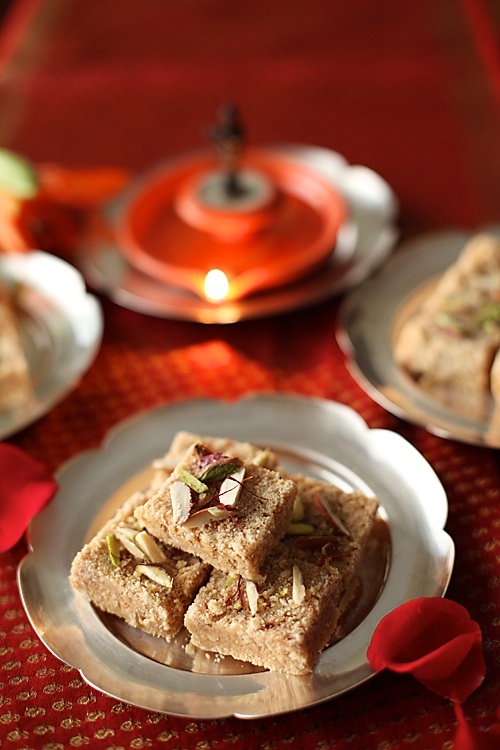 the burfi looks awesome and is my all tim e favourite. great pics n fab write up! Hope you had a wonderful Diwali Anushruti. Read the 7 cup recipe with 'eyes wide open'…I love recipes like this. Something like the tradition behind the pound cake! Beautiful post. Anushruti…..does white granulated sugar mean NORMAL sugar that we use? A very happy diwali and a healthy, wealthy and joyous new year to you and your family. This recipe looks very easy and delicious. I shall try it sometime this week. Thank you for giving us such wonderful recipes. Here is a link to a new blog with lovely recipes. Absolutely delish , i always leave ur blog with something, a bookmark add! First, I would like to say Happy Diwali, this is a day late, but I hope it is filled with Joy, Peace, love and prosperity. and secondly, THANK YOU very much for sharing this priceless family treasure with us. I am definitely making this. All the ingredients I have at home. This Diwali I made burfi that tasted like the Kunda from Belgaum, using ricotta cheese (it resembles paneer), heavy whipping cream and milk powder, since we do not get mawa here in the U.S. the result was amazing. Now, I have a new burfi recipe to try. A question though, Do you not need to roast the Besan in ghee to lose the raw flavor? Aparna: Thanks and wish you the same. Your burfi sounds delicious. You are cooking the besan along with the other ingredients for 30 to 40 minutes here. So, it not only loses the raw flavour but also acquires a lovely toasted aroma so typical to besan. What camera do you use?Your photos are indeed divine!Did you buy the camera in India? I love to read your write up to each dish as much as I yearn to see the pics accompanying and the dish itself!That is what sets your website apart from all!You incorporate such raw and real emotions to the day that lead you to cook the dish.Cant wait to read more! Shilpa: Thanks. I use a Canon 5d mark2 and a Canon 40D. Your writing style is beautiful, like a song. The recipe looks delightful too! I have this seven cup cake on the blog too-i made it as 6 cup cake with 2 cups of sugar and it turned out fine. The garnishing you have used is making these look so gorgeous. Made this over the weekend and it was spectacular! However, I only added 2 cups of sugar without affecting the consistency. Of course, I don't know how it'll turn out with three cups but I think 2 cups was pretty good too 🙂 Thanks for sharing! This receipe looks really great Anushruthi….Really like your web site and your patience to explain everything. Please advise whats your energy booster? ;)!!! ive become a huge addict to ur site..wenever my hubby is not usin his lap i immedietly open ur site and enjoy readin ur recipes…they r too good…thankyou…i tried meltin moments they came out good..my hubby liked them…waitin to try somemore recipes.ur pics are awesome and the writeup is so nice and warm…thanx again ..
Swetha: Thank you for your comment and happy that you are enjoying it here! Wish you and your family a very happy Deepavali! As much as I love the tradition of celebrating Deepavali and try my level best to continue it for my little one, it feels that their generation will never get to see Deepavali as we did be it the oil bath at 4:00 am or the rest of the festivities..
7 cup burfi is such a trademark sweet, yours look delightful! Radhika: Thank you very much and wish you the same. You are right…things have changed so much and its a pity that our children will never get to experience the pure joy and simplicity of the festival. 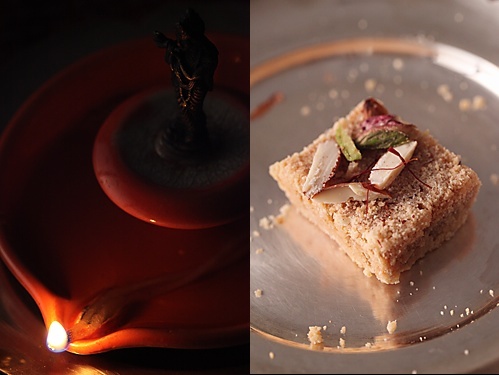 I tried reducing the sugar this Diwali to 2 cups as I found 3cups too sweet and disaster!the burfi wouldn't set quickly as usual and has a fudgy taste.Let's not tamper with our grandma's recipes. Usha Subramanian: Well said! Like you I have learned it the hard way too! All your recipes are amazing and specially picked/posted by you. About this recipe or in general about burfi…..how long is the shelflife and can it be stored longer in the fridge? Chandra: Thanks. The shelf life is about a week stored in an air tight container or 2 weeks stored in an air tight container in the refrigerator. I guess will repeat it soon…. was planning to reduce the Sugar from next time, what if the sugar is reduced and any of the other ingredients like besan or coconut increased…? will it b alright if i freeze it?? anu di… how r u? Many Thanks and A Happy Diwali, Anushruthi! I tried this recipe after many flops of burfi which would come out as halwa despite following all the possible steps. You have given clear measurements with approximate time when the buffi is closer to finish line, it was very helpful. I'm happy this recipe was of help to you Sheela. Thanks for the feedback! Good to know that Durga!